The Perfect gift for someone special. Dendrobiums are famous worldwide for long lasting flowers and plants which are vigorous and easy to grow. This makes them ideal gifts, and one of our top selling plants for Christmas. One of the most stunning Noble Orchids ever. Exquisite flowers - last up to 15 weeks! The ultimate house plant, Superb, long lasting value. 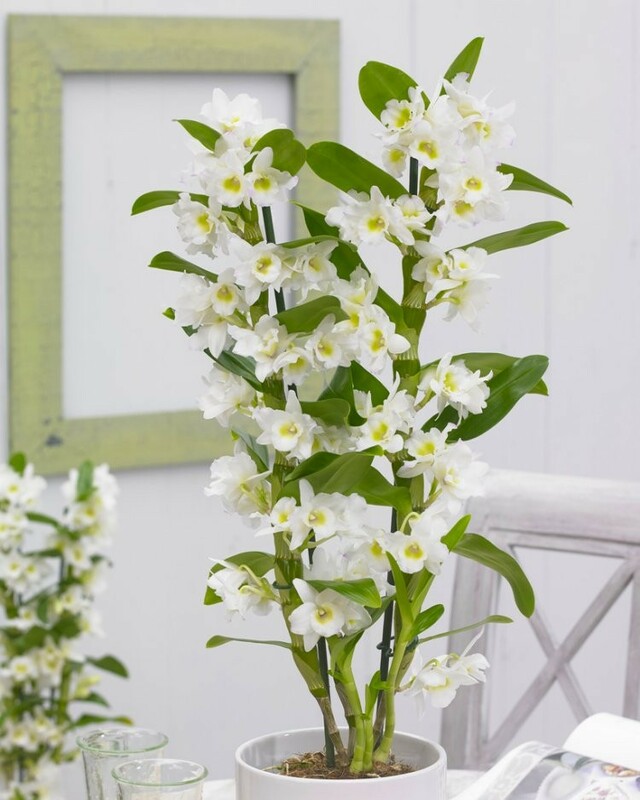 If you normally buy cut flowers for your home, or just love the idea of an exotic house plant, you'll absolutely adore this stunning scented 'Dendrobium' Orchid. Creating far more impact than any ordinary floral display, its magnificent tower of delicate snow white flowers tinged with citrus yellow rising up on a tower of tiered, rich glossy green leaves, really is a sight to behold. Not only are the blooms beautifully fragrant, they're incredibly long lasting too - up to 15 weeks a year! Just think how many bunches of expensive cut flowers you'd have to buy over the same amount of time - and it'll do the same next year too! Even though the 'Dendrobium' Orchid is one of the most unusual and dramatic looking home exotics you can own, it's extremely easy to care for and will thrive in most houses, even down to temperatures as low as 55F/13C. Supplied complete with a classic white display pot as a mature, fully established plant in bud/bloom and overall around 40-60cms (1.5-2ft) tall, simply position and enjoy. The 'Dendrobium' Orchid not only makes a superb house plant but it's ideal for the office too! Colour supplied may vary slightly according to availability. It's easy to see why similar orchids are sold for as much as £40 elsewhere, and why these beautiful plants are found in High Class Department stores. 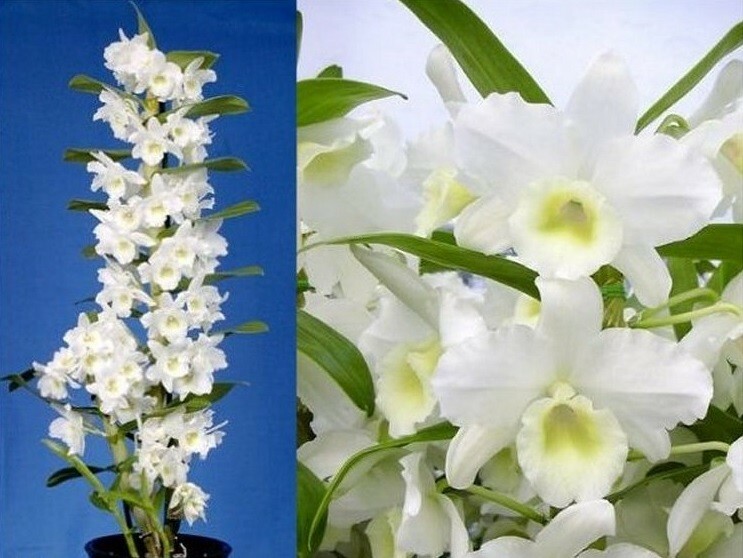 With it's long lasting blooms, the Dendrobium nobilis orchid with its impressive column of white flower clusters makes a fantastic gift at any time of the year. The sophisticated and stylish look of the snowy white twinkling blooms are especially popular at Christmas time. Plant Supplied as pictured - Check the quality - why not try as a beautiful gift for friends and family?